Asking the right informational interview questions will ensure you make the most of this excellent networking opportunity. Before you start to think about the questions you will ask, it's important to know that there are two types of questions you must never ask at this type of meeting. Never ask, "Are you hiring right now?" When you set up an informational interview, you will tell your contact that you are looking for information, not a job. If you turn around and ask for a job when you meet with your contact, he or she may feel as though you lied and set up the meeting under false pretenses. Don't worry, there are other, more effective and subtle ways to find out about job leads during an informational interview. Do not ask informational interview questions that you could have easily answered by doing a bit of research. The person you are meeting is doing you a favor by giving up time to help you with your career planning. If you ask questions that could easily be answered by reading the company's website or doing other simple research, you will not appear to be well prepared, which will make your contact feel you are not truly interested in the work. Your contact could become an important part of your business network, so you want to do everything you can to make a great impression, which includes coming to the meeting with a good basic knowledge of the industry and the company. 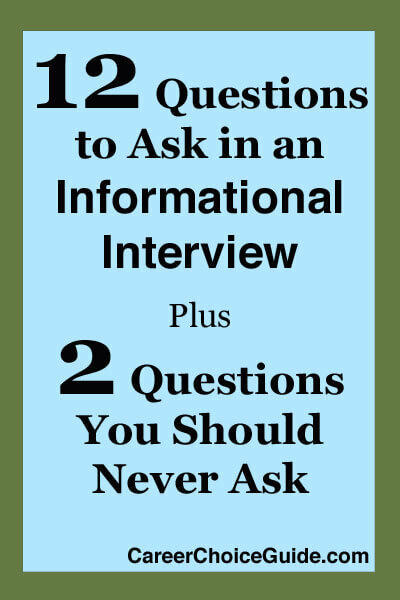 Plus, an information interview presents a unique opportunity to gather inside information about an industry. You don't want to waste time gathering information that is easily accessible when you could, instead, be gathering far more valuable information that is not accessible in any other way. Now that you know what not to ask, here are several great informational interview questions you can ask and why you should ask them. 1. Can you tell me about a typical day on the job? This is a good opening question because it will provide you with a good overview of the day to day requirements of the job. It is an easy question to answer and will help your contact open up and start sharing information. 2. How did you get started doing this type of work? This informational interview question can provide you with some insight into the typical career path of someone in this line of work as well as information about the skills, education and experience you may need to develop to be marketable in the field.Notice the question is focused on the person you are interviewing. This tactic is helpful at the beginning of the interview because people generally enjoy talking about themselves. You will show your contact that you are genuinely interested in him or her and build rapport while, at the same time, gathering extremely helpful information. Another open ended question focused on the person you are interviewing. It can draw out surprising and rewarding aspects of the job that you might not have considered. 4. What is your least favorite part of your job? 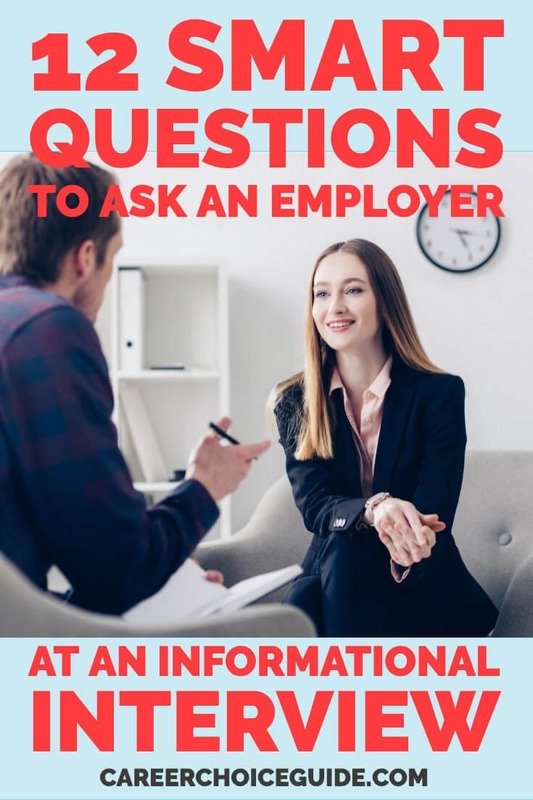 Asking this informational interview question can help draw out any potential downsides of the job that might not be obvious to an outsider.For example, a workshop facilitator might tell you he dislikes all of the paperwork he is required to deal with. If you had simply attended one of the facilitator's workshops, you would see the public part of the job (running workshops), but you wouldn't know about the private side of the job (managing a lot of paper work). 5. What surprised you the most when you started working in this field? This question is also great for drawing out the kind of inside information that only someone in the job could share with you. 6. What is the typical starting salary for someone in this line of work? People are typically uncomfortable stating their salaries. Do not directly ask the person how much he or she makes; you will make them extremely uncomfortable and break down any rapport you had built up! However, if you ask about salary in this more general way, you can often get an idea of the range. 7. How do you see this industry developing in the future? How is your industry changing? This informational interview question can give you insights into skills you might need in the future. If you develop those skills now, you'll be more competitive when looking for work in the industry.Additionally, the job might be ideal for you now, but it might be changing in a direction that is not a good fit for your needs. It's important to find that out in the beginning of the career planning process, so you can make informed decisions about the career choices you will make. 8. What advice would you give to someone who wants to get started in this industry? This question starts to shift the focus of the interview from your contact to you. It is a great question to help you discover insider tips for making yourself as marketable as possible in a specific industry. 9. What are employers typically looking for when hiring people in this line of work? Another question that will help you determine how to ensure you are employable in the industry. 10. My background and experience is (briefly note your major qualifications). How does that compare with employers' expectations when hiring in this industry? This question is key if you are conducting an informational interview as part of a job search (as opposed to doing the interview as part of a career decision making process).This question gives you the opportunity to present some of your qualifications to your contact, and, if your contact is aware of a job opening, it can prompt him or her to mention that opportunity if your qualifications are a good fit for the job.This question can also lead to your contact asking for your resume. Never offer your resume in an information interview unless your contact aks for it, but do be prepared to provide one in case you're asked. 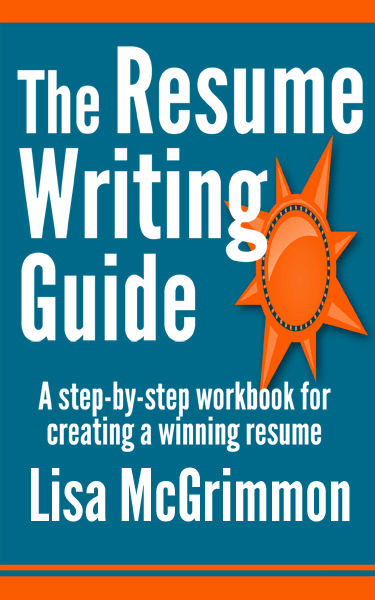 If your contact does ask for your resume, you can take that as a great sign that he or she is impressed with you. 11. May I have your business card? Always ask for a business card at the end of the meeting so you have all of the information needed to contact this person in the future and to send a thank you note. 12. Is there anyone else I might talk to about this? May I use your name when I contact that person?Always ask this informational interview question. If your contact knows about job openings, this question can prompt him or her to mention those opportunities. Alternatively, your contact may give you the name of another person who you can interview, and when you mention your contact's name to the next person, your next interview will be that much easier to arrange. Type out a list of the informational interview questions you want to ask and bring it with you. Once you ask the first couple of questions, you probably won't need the list anymore. Typically, your interview will turn into more of a conversation, so you won't need the list to generate discussion, but you'll still have your list ready to ensure you get all of the information you need. It's fine to take notes during an informational interview. Just ask your contact for permission first to ensure he or she feels comfortable with that. Always bring your resume to an informational interview. It's not always appropriate to present your resume during this type of interview, but the conversation may naturally turn in that direction. If your contact asks to see your resume, that's a good sign and you'll want to be prepared. Bring your own personal business cards to every informational interview. Your contact may not know about any job leads at the time, but something might come up in the near future, so you'll want to ensure that he or she has all of your contact information. Providing a personal business card is the easiest, most professional way to ensure your contact has that information.